Primitive craft are the latest craze! You hear about making “grungy” Ornies and Prim Annie Dolls and Primitive Gingerbread or Gingers. Part of what make these items so fabulous is the “Grungy” part and the stained look. I have been seeing lots of the Primitive Hang Tags and started researching “stains” and if coffee vs. tea was better or not. 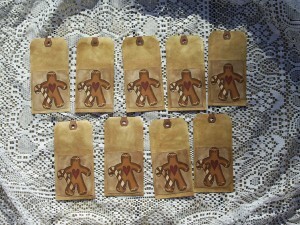 Here’s a great start to creating your own grungy hang tags. This is a great “How To” website with lots of photos on How to Make Tea Stained Hang Tags. Visit here.